This Copycat Starbucks Passion Tea Lemonade Recipe is going to save you some big bucks this spring and summer. Or maybe even today ha ha! I have been craving spring and summer drinks this past few weeks. My CopyCat Sonic Cherry Limeade that I shared with you has really helped me cure these winter blues. I will admit I drink Iced Tea year round as it is my favorite cold drink. When spring and summer arrive I will jump on the flavored Iced Teas. Add ice to a tall closeable container. Add 8 oz tea and 2 oz of lemonade per serving. Shake well to mix. 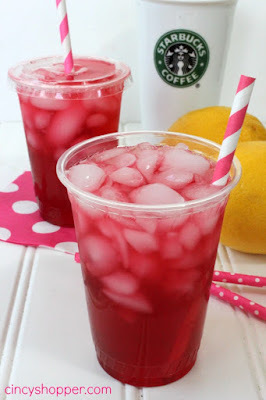 Making your own CopyCat Starbucks Passion Tea Lemonade is so simple Just grab yourself some Tazo Passion Fruit Tea Bags and some Lemonade. Combine it with some sugar and a hint of Vanilla and you will have yourself a tasty and cheaper version right at home. 0 Response to "COPYCAT STARBUCKS PASSION TEA LEMONADE RECIPE"